If you’re an education leader concerned with science, technology, engineering, and mathematics (STEM) initiatives, this book will help you both understand and implement STEM action plans. The book starts by putting STEM in context, as the early chapters outline the challenges facing STEM education, draw lessons from the Sputnik moment of the 1950s and 1960s, and contrast contemporary STEM with other education reforms. The author then explores appropriate roles for the federal government as well as states, districts, and individual schools. Finally, the book offers several ideas you can use to develop actual action plans for STEM. Throughout the book, author Rodger W. Bybee puts an emphasis on both thinking and acting. That’s why The Case for STEM Education is a must-read for leaders at all levels: national and state policy makers, state-level educators responsible for STEM initiatives, college and university faculty who educate future STEM teachers, local administrators who make decisions about district and school programs, and teachers who represent STEM disciplines. Read a sample chapter: How Is STEM Education Reform Different From Other Education Reforms? 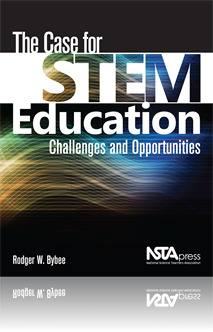 Although clearly a key text for anyone teaching or involved in STEM education in the U.S., there is probably insufficient relevant information for most teachers outside the U.S. … However, this book could be useful for anyone with specific interests in developing or researching aspects of STEM education, including historical, comparative or global studies. This text is an amazingly high–level presentation of the "challenges and opportunities" afforded to our children from President Obama to NCLB. ... As the title of this book implies, it is an exciting time to be an educator because with this historic challenge, we have a monumental opportunity. The Case for Stem Education is a necessary reference for anyone involved in negotiating the policies and practices that will impact teachers and students into the 21st century.